On June 30, 1894, Tower Bridge in London opened to the public. 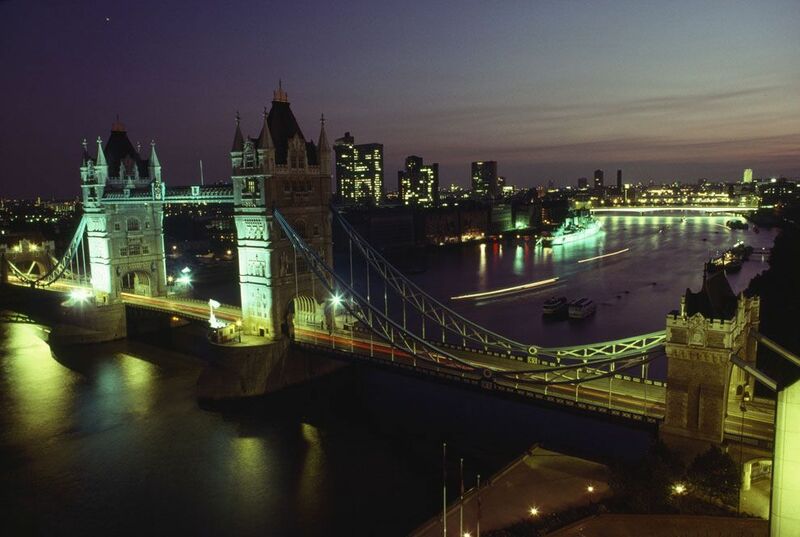 The two towers of Tower Bridge dominate the skyline of London. The bridge is able to elevate its roadway to make way for boat traffice on the Thames. On June 30, 1894, Tower Bridge in London opened to the public. Tower Bridge was the second major bridge to cross the River Thames near the metropolis of London. The “London Bridge” had existed in one form or another since the ancient Romans founded the city, and by the 19th century, thousands of drivers and pedestrians were using it every day. City planners and workers needed another bridge to improve the city's traffic problems. The new bridge would have to be moveable, or able to elevate part of its platform, in order to allow tall ships to reach the port of London. This is called a bascule bridge design. Today, Tower Bridge is an iconic symbol of London. It is a bascule and suspension bridge able to elevate its roadway for boat traffic. The bridge is 244 meters (801) feet long, with two large stone towers anchoring it in the Thames. The bridge is not named for its own towers, however—it is close to the Tower of London, an historic castle and prison. large settlement with a high population density. to raise higher than the surrounding area. event or symbol representing a belief, nation, or community. bridge with its deck hanging from cables strung between towers. movement of many things, often vehicles, in a specific area.